This week has been quite hectic with the big event, Art Basel on, where the big name galleries presenting big name artists from Picasso and Alexander Calder (very popular this year), to Takashi Murakami (always a favourite) and Cindy Sherman. It's quite pretentious with collectors wearing lots of bling and very deep pockets dropping tens of thousands of US dollars to even millions on art pieces for investment. Meanwhile an interesting counterpoint is Art Central, a much smaller and accessible show, of which 75 percent are artists from Asia, some very young, others quite established. Many of the works are experimental, and not as polished when it comes to execution. 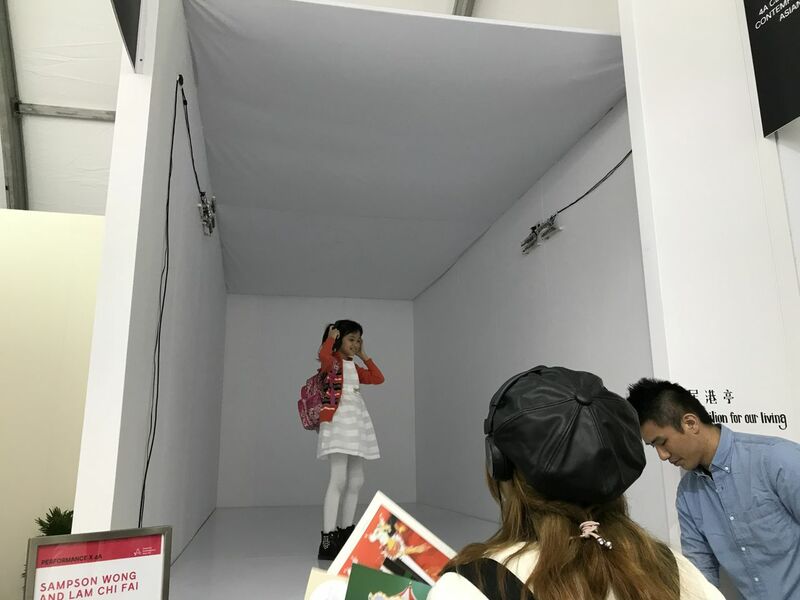 I literally whipped through Art Central and didn't have much time to slowly walk through it, but managed to see an interesting piece called Pavilion for our living, by Samson Wong and Lam Chi-fai. It's a socio-political statement about subdivided flats and what it's like to live in 130 square feet. Visitors, one at a time, put on head phones and wander around the rectangular box space as the narrator, an artist, explains where all their furniture is situated and how cramped it is, how difficult it is to fit everything in and how little natural sunlight there is. However, it's hard to imagine what the room looks like when there are only red laser dots pointing at places like the refrigerator, the bed, bathroom and so on, but little details the artist I listened to, were memorable; she talked about a mouse in her flat and seeing its paw prints, or how her father was dismayed she was living in such a small space and tried to rearrange the furniture when she was at work which irritated her. My colleague who also listened to the same story felt the installation would have been more powerful, if pictures of the artist's flat were projected on the walls so that we could have a better idea of how it looked inside. The speech the artist made could also have benefited from some editing as some anecdotes were tedious or unnecessary. Nevertheless, the idea was definitely there and is worth exploring further. In this case, life = art = social statement.